The diminutive "blikje", however, is almost always used for a can of beverage. 1. "Verkoopt u blikjes bier?" 2. "Die man heeft een stoïcijnse blik." 3. "Jouw blik bevalt me niet!" – "Als blikken konden doden…"
Sometimes, near traffic lights you’ll find some kind of big scoop net with lots of junk in and around it where it says "blikvanger". This is a pun, since other than catching the eye, it also catches cans (and other trash). This is supposed to prevent people from carelessly throwing their trash out of the window, but it does not really make the point clear that one is not supposed to throw trash on the road anyway! 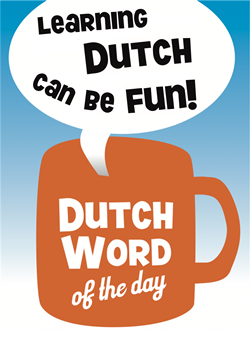 This entry was posted in Dutch word of the day, DWOTD 1.0, Vocabulary Basic and tagged blik, blikje by Dutch Gurus. Bookmark the permalink.